Intel has officially revealed their server-focused Cascade Lake-AP (Advanced Performance) platform, delivering a staggering core count of 48 on a single package with a whopping 12 DDR4 memory channels. While this design is groundbreaking for the company, it would be remiss of us to not remind you first of Intel's Skylake-SP marketing materials, which called AMD's EPYC series processors "Glued-together" in an effort to drive customers away from the affordable server platform. You can probably guess what Intel has done to achieve such a high core count with Cascade Lake-AP. Yes, they are using two interconnected CPU dies to merge two processors into a single package. You could even go as far to say that Intel has done a "Threadripper" with Cascade Lake-SP, joining two dies together to create an interconnected whole. Can you smell the glue yet? In effect, Cascade Lake-AP is similar to a dual-CPU Cascade Lake-SP setup, which connects two CPU dies together using UPI links, though it is likely that their "on-the-die" interconnect will result in lower CPU-CPU latencies than an equivalent Skylake-SP dual-socket system. Intel hasn't even used their cutting-edge EMIB technology for inter-die connectivity, a solution that Intel can use to replace silicon interposers on multi-die products. This design is how Intel's Cascade Lake-AP processors can offer such a high core count and such an insane number of DDR4 memory channels, as the company has, basically, merged two 24-core processors with six memory channels into a single unit. Beyond that, Cascade Lake-AP can scale to a dual-socket setup to offer up to 96 cores on a single system. Strangely, Intel has not mentioned this CPU's Thread count, suggesting that it may not support Hyperthreading. At this time, Intel has not disclosed the TDP, clock speeds or PCIe configuration of their Cascade Lake-AP series processor, though they have claimed a 3.4X performance boost over AMD's EPYC 7601 processor in Linpack and a 1.3X increase in Stream Triad performance. On the AI-side, Intel has claimed a 17X boost to Deep Learning Inference performance of their first Intel Xeon Platinum Processors when they first launched. Thanks to Cascade Lake-AP's large dual -die processor design, and its new 12-channel DDR4 memory subsystem, it is pretty much a given that this new platform will require a new socket to operate, one that is larger than Intel's already substantial LGA-3467 socket. Intel is expected to release more information about their Cascade Lake-AP processors at the 2018 Annual Supercomputing Conference, though the company has claimed that Cascade Lake-AP will release sometime in the first part 2019, which means that Cascade Lake-SP and AP will likely launch at the same time. You can join the discussion on Intel's Cascade Lake-AP series of processors on the OC3D Forums. 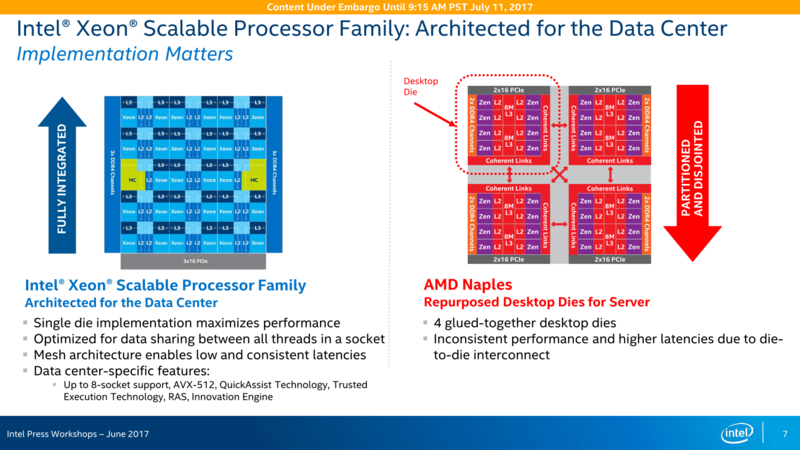 Does anyone else remember when AMD were calling the then new Core2Quads "glued together" (or words to that effect) as they were apparently two Dual Core CPU's on the same Die? At the time AMD were touting their quad cores as "true quad cores" - I remember the hype as I almost fell for it before doing some homework. I was a die-hard AMD fan at the time but took a gamble on the Q6600 when it released. That same CPU is still in regular use today, damn fine bit of kit that. Basically, I don't really care what the process is - though I am of course interested from a technical stand-point - as long as it delivers. The old Core2Quads delivered back in their day, as has Ryzen though reviewers have noticed the latency issues between the core clusters - sorry, I forget the correct technical term - but Ryzen certainly seems to be delivering, thoroughly embarrassing Intel from a price / performance perspective while still providing excellent performance. I think it's great that they can scare Intel in the server market too, though I do wonder what the actual adoption figures are, and if any large organisations are making the switch to AMD for their servers. Epyc seems like it's going to be AMD's strongest product in terms of revenue and consistency. They expect to end this year with 5% server share (Starting from essentially nothing at the start of the year, with the vast majority of it expected in the last quarter as their server ramp only really begun in Q2) but they do have adoption from Cisco, Oracle, Dell, HPE, ect (Some possibly by necessity with Intels supply issues) as well as a few of the super eight I believe so it seems likely they'll keep growing strong from there. It's no surprise Intel has pulled a move like this in response; A big part of the "Cost per cycle" benefit that companies like Oracle were touting for the Epyc-based servers compared to their Intel counterparts were due to the fact that you could stuff many more VMs onto an Epyc-2P board than an Intel equivalent(Due to more cores and memory bandwidth).